Having a bit of paper towel around in case of spills is an excellent option. As the homeowner, when you’re working in your kitchen, if your kitchen is clean and you treat your countertop with care and respect, visitors will notice and follow your lead. Does it work every time? No. But it works a lot of the time. When trivets (cloth or the kind with rubber feet) are judiciously placed in spots like the countertop right above the knife drawer, the countertop right beside the stove, and the countertop right below the plate cabinet, people have a natural tendency to use them. It sends the subliminal message that you do not want them to put things directly on the countertop which might scratch it. Having trivets ready to use is enough to bring the message home. The same is true of coasters and mats. 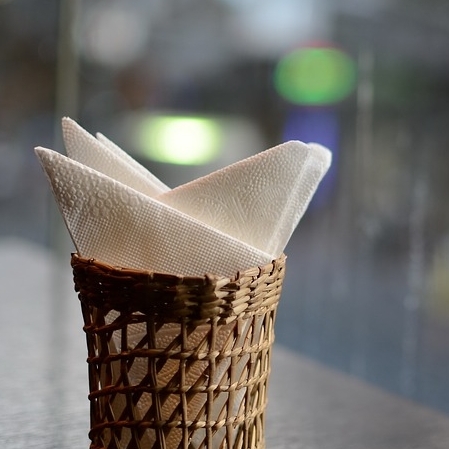 Having paper towels available to grab in the event of a spill gives guests the ability to wipe up a mess. No one wants to leave a mess. On the other hand, they might be reluctant to use your best guest towels to wipe up a spill. The solution is to keep paper products handy for guests. Keeping your countertop sealed and clean will do a lot toward buffering those stain-producing spills. If the countertop is regularly sealed, it will handle spills better than one in which the sealer isn’t routinely applied. After the guests have left, if you still have concerns, do a quick run through to make sure there aren’t any unattended spills. Truthfully, unless you invite the Three Bears over for drinks, there probably won’t be a problem with spills. But, look around when the guests leave, especially if there was a bit of drinking or if the visitors had younger kids. If you do happen to find a problem after the fact, and it isn’t something you can handle, call professionals for help. Sometimes, it’s worthwhile to buff those scratches out rather than to try to live with them and feel perpetually unhappy about it. If you have a home, business or rental property in the Metro Phoenix area and are considering upgrading with granite countertops or other stonework features, call us here at JDM Countertops at 602-461-7559. Older PostDo Countertops Have to Match?